Henri is a black-and-white cat known as the world's first and foremost feline philosopher. 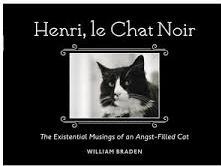 Online, he offers up short films depicting his general ennui; his first book, Henri le Chat Noir (Ten Speed Press), offers up the same "existential musings of an angst-filled cat" via a collection of photographs and quotes from Henri. His droll insights and dry wit, coupled with dramatic black-and-white photography, combine to create a book that will fit perfectly on the shelves of any philosopher, cat-lover or philosophizing cat-lover. Grumpy Cat's tagline just about sums up the frowning feline's take on the world: "I had fun once. It was awful." Grumpy Cat's book from Chronicle, aptly titled Grumpy Cat, combines new photos of the well-loved frowning face with classics from the Grumpy Cat blog to offer new readers and long-time fans alike a dose of serious grumpiness--though the images and captions are just humorous enough to turn most frowns upside-down. The only who will not be amused by Grumpy Cat's antics is, of course, Grumpy Cat. This column has been edited from the original version, which ran in the Tuesday, August 27th issue of Shelf Awareness for Readers. If you don't already subscribe, sign up here to receive a bi-weekly dose of readerly goodness in your inbox. This is such a bizarre and interesting phenomenon to me--that publishers are confident enough that the public will pay money for books with identical content that consumers can access on line for free. That being said, I got a free copy of the Maddie book (and got to meet her and her owner at a bookseller thingy last winter) and was thrilled to get it.